Spring has 10 days until it officially arrives, but someone forgot to tell the Spring-like weather that has hit Charlotte over the last few days. The trees have begun to blossom and after a long winter, Sally and I are both ready for the warm weather! 10 days is close enough, so we are welcoming Spring’s arrival! What better way to do that than with a dish inspired by the weather. 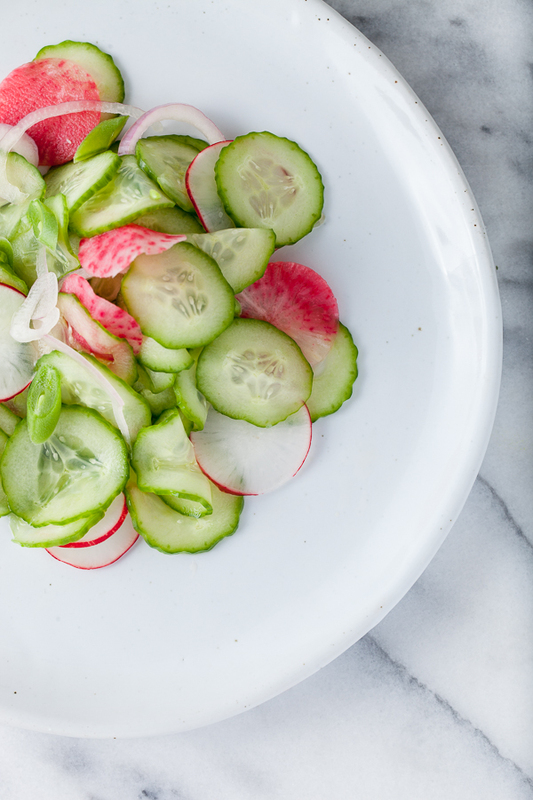 This Spring Cucumber Salad’s light and refreshing flavor is the perfect way to welcome the warm weather. If Spring to you is the official start to grilling season, then serve the salad with a side of barbecued chicken or a nice steak. If you are eager to spend your springtime through hiking, camping, or picnicing, pack the salad in a half gallon sized mason jar and take it on the road with you! 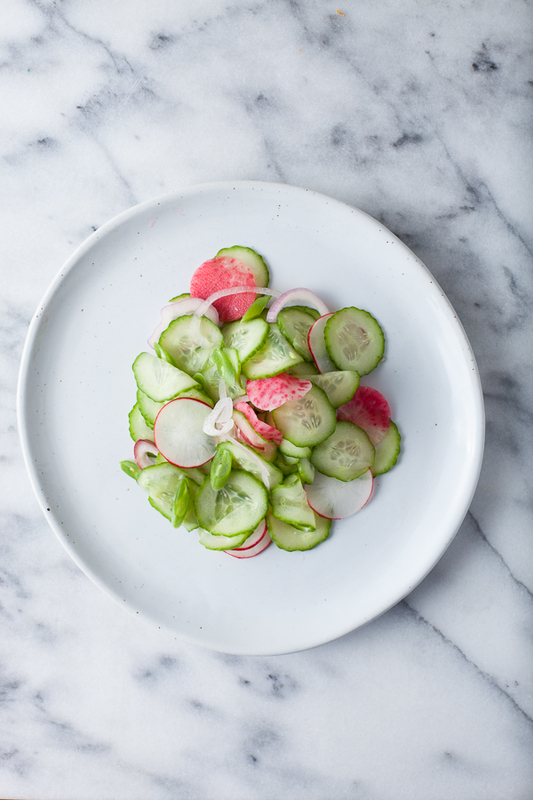 Part of the light and refreshing nature of this salad comes from the thin slices of cucumber and radish. For even, paper thin slices, it is best to use a Mandoline (Like This One ). Just make sure to always use a guard to protect your fingers (I feel like it should be my Mom telling me to remember the guard and not the other way around. When making this recipe, Sally got a little too assertive in her Mandoline abilities and almost took part of a fingernail off with the cucumber). 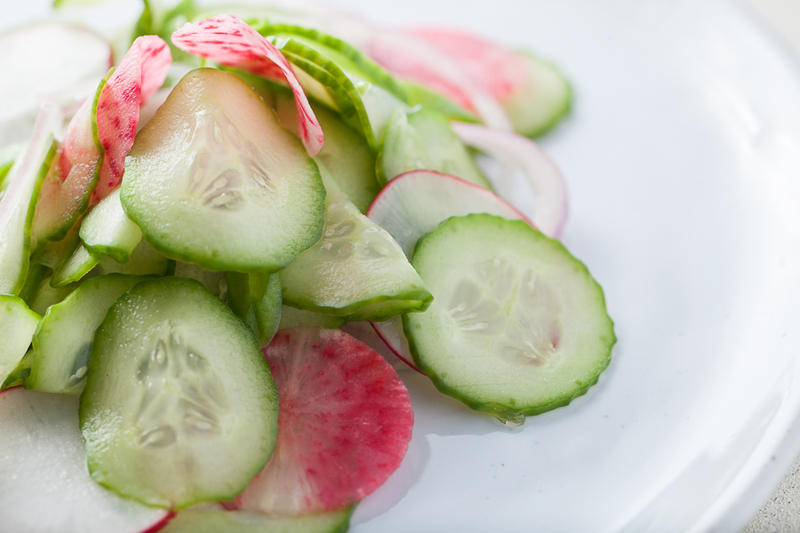 With the watermelon radishes, Sally decided to use a small circle cutter to makes the watermelon radish slices the same diameter as the mini cucumbers. I decided that the slices would make perfect glasses. 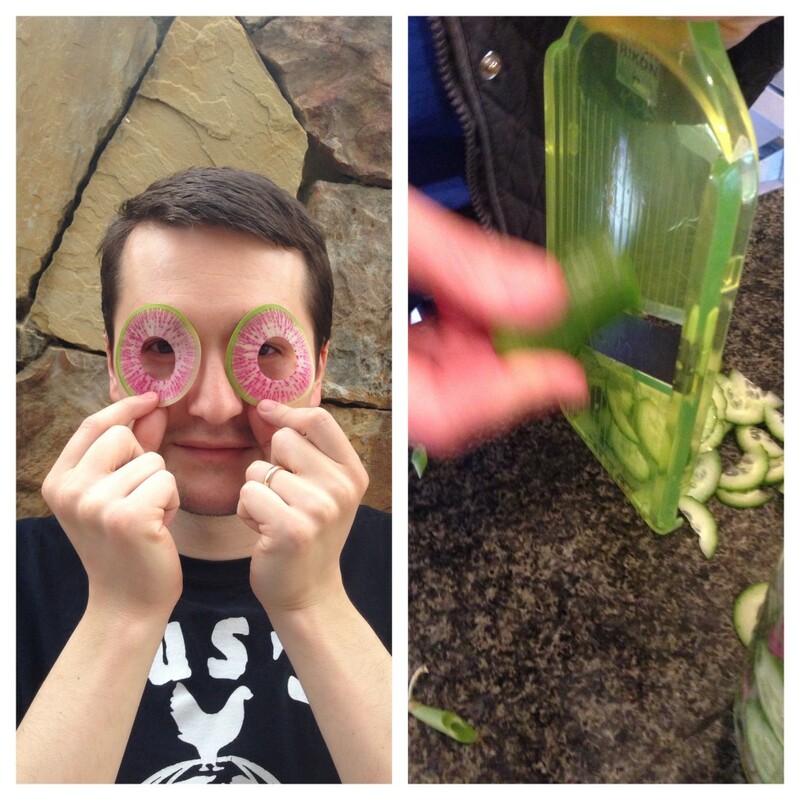 Use seedless English Cucumbers or Mini Cucumbers. 1. Put the cucumbers, radishes, shallots and green beans into a large bowl. Toss to blend. 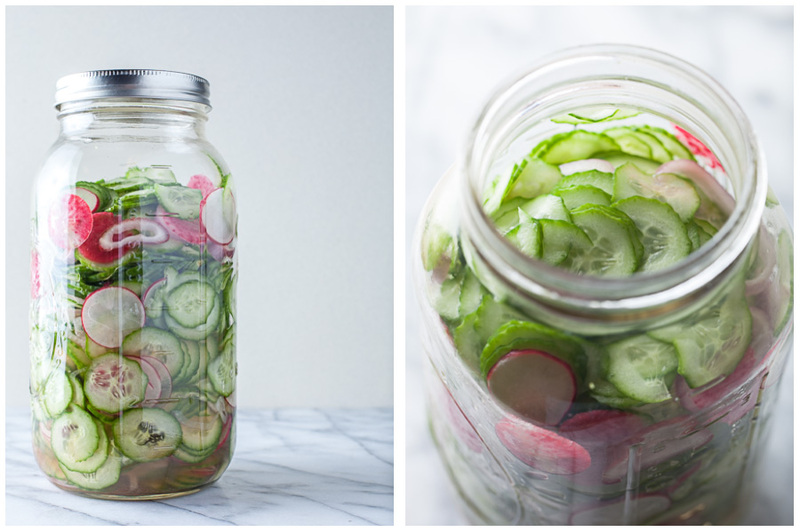 Fill a 1 quart Mason jar (or lidded container) with the vegetables. Set container aside. 2. In a medium bowl, add the apple cider vinegar, apple juice, lemon juice, brown sugar, salt and white pepper. Stir the ingredients until they are well blended and the sugar is dissolved. Pour the vinegar mixture over the jar of cucumbers. Seal the jar. Shake the jar for 20 seconds. Refrigerate the cucumbers and shake every 15 minutes for the first hour. You may serve the salad after it has chilled for one hour or keep it in the refrigerator (shaking occasionally) or 24 hours before serving. This salad just looks like spring! Beautiful! Taylor, you look great too…. I just discovered this awesome recipe on Pinterest. Like! Will make today. Thanks for sharing.